Do you live in Bangkok? Are you one of those who throw their garbage anywhere? If so then you are in for a hex! 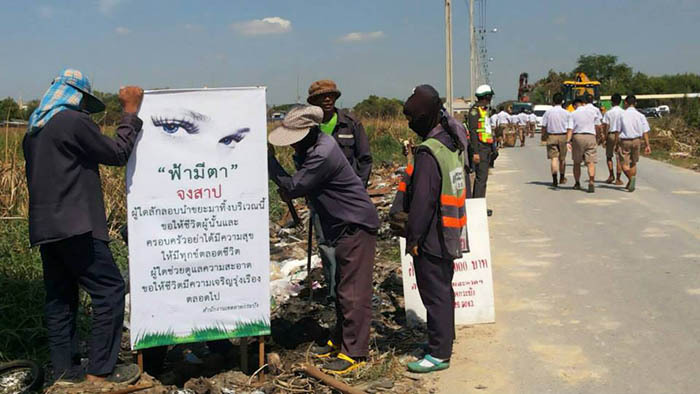 The officials of Lat Krabang district put up a sign yesterday hexing people, after citizens ignored the call of Bangkok Administration not to chuck their trash in non-designated spots. “The sky has eyes. It will curse you! Anyone who litters in this area, we wish you and your family would never find happiness for the rest of your lives. For those who keep the area clean, we wish you blessing and success forever,” reads the banner. Even if you’re not a superstitious type of a person it’ll make you think twice.